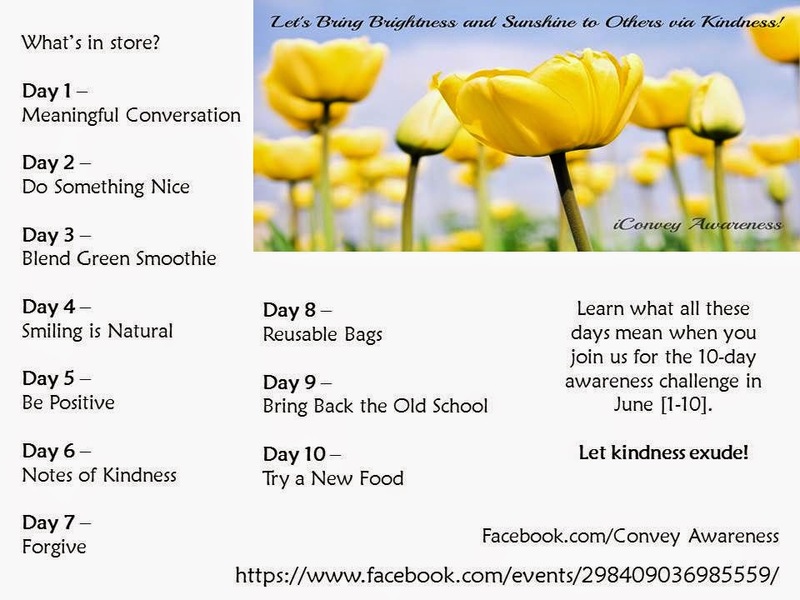 Join me on June 1st for the next rendition of the 10-day awareness challenge. Each month for the first 10 days, I host a wellness challenge. Over the last 5 months, the challenges have consisted of: juicing, ACV shots, eating the [real] rainbow, oil pulling, and more! RSVP at the link above. As a Certified Health Coach, I focus my teachings on the 4 pillars of health (L.E.A.N.) identified as Lifestyle, Exercise, Attitude, and Nutrition and many of my resources point to the L and N and occasionally they focus on the E but this challenge will focus on the A and it will include several components of the other letters. Here is a sneak peek into what each day's challenge will look like. I will post the day's challenge the night before so that those on different time zones can participate. You'll post on the wall what you did and if you have images of your thoughtfulness, you're welcome to share them as well! Having the right attitude in our wellness journey is what helps us open up the possibilities. I shared a guest post on Heal Thyself about Smiling and in there I talked about how when we smile first thing in the morning (even when it's hard) it will help create the tone throughout the day. So when it comes to being kind, when we reach out to do unto others, we will receive blessings in return. Kindness is a win-win situation. While it's important to be kind to others, we need to remember to be kind to ourselves, too. We must pull from a place of satisfaction, love, and acceptance in order to give fully and authentically. Join us! It'll be fun and rewarding, and great for your immune system. Awesome! This is such a positive and healthy challenge. It's so great to focus on acts of kindness and to share them with others! I look forward to participating in future challenges! Thank you so much for sharing this powerful kindness challenge with us at the Plant-Based Potluck Party Blog Hop! I appreciate it!